It gives me great joy, on behalf of the UBUNTU USA team, to launch our new strategy and our simple plan of action, which we call "One Small Town, Can Change The World." Our objective is to turn one small town in the USA into a small paradise, the kind of place that most of us have dreamed of all our lives - and to lay the foundation for a new social structure and a world free from economic slavery. This one town will create a domino effect around the world, as people everywhere will want to do the same to escape the economic slavery imposed on everyone. 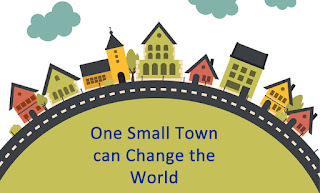 Please read our Manifesto for “One Small Town, Can Change The World” and make a donation on the soon to be launched crowd funding page - to help the volunteers of the UBUNTU USA team to make this a reality. Become a seed of consciousness by sharing this message with everyone. Let us become the makers of our own reality and manifest the beautiful utopian world we all want to live in.